The dishes are done, floors cleaned, beds made, and the pets are fed. Wouldn’t it feel great to know at a glance what household chores were done and which weren’t? There is so much going on in a busy home that it’s hard to keep track of chores, but with the right tools that process can become much easier. 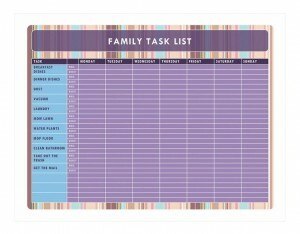 Our family chore chart is the ideal tool to achieve household organization. You can download our family chore chart for free on this page. It can be customized, so that you can add the daily tasks and chores that matter to your family. With our easy to use template you’ll have an organized home in no time! First, fill out the task column with household chores. Next, add names to the different tasks based on your choice of scheduling. When someone completes a task, remind them to put a check-mark or sign their initials in the “Done!” row. Before you start filling out the family chore chart, use a piece of paper to brainstorm all the daily chores in your household. When scheduling chores, don’t forget the schedules of your family. If Tom has soccer practice on Tuesday nights, then it would be better if he mowed the lawn on a different day. Consider creative uses of the family chore chart such as making it open-schedule. Each chore would be worth a certain number of points, and you could require that everyone in the household score a certain number of points per day. When you’ve completed the chart for a particular week either recycle it or save it for record-keeping purposes. Household organization can be a tough task to tackle, but with our family chore sheet template it has just gotten a whole lot easier!